This is Part 2 of the small batch clone of Fuller’s London Porter! In Part 1, I did some research and recipe design. In summary, the Fuller’s London Porter is a fairly simple recipe. Its key ingredients are a significant portion of brown malt, along with Fuller signature yeast. For part 2, I review both the commercial version and my homebrew clone. Lets see how my first attempt clone stacks up to this great beer. Cheers! 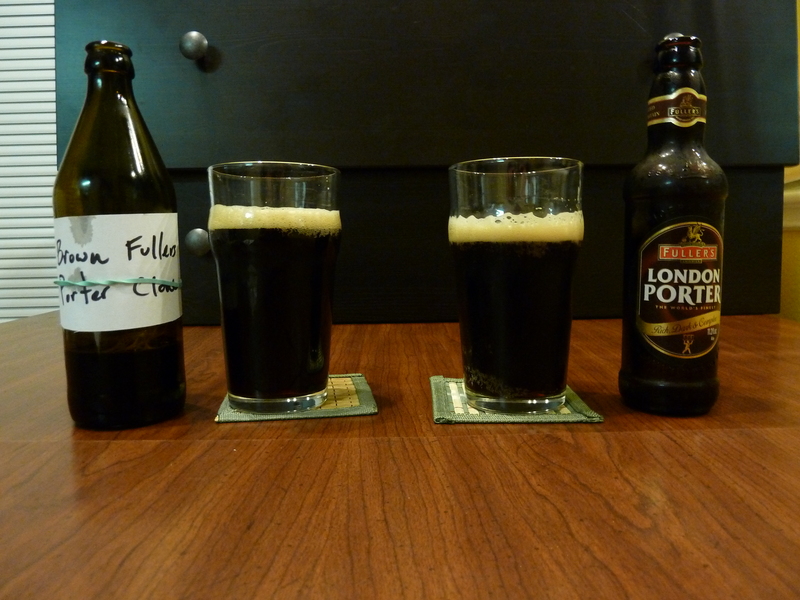 The clone (left) vs the real thing (right) of Fuller’s London Porter! The real thing (right): Pouring into an English-style pub glass, this porter is dark brown with an off-white head in appearance. Aroma is coffee, cocoa like with strong tones of nut and light hints of fruit. Tasting the beer is more of the same, chocolate, coffee, tree nuts, with pear-like fruits. Also, the bitterness is more balanced with a edge towards the sweet side. The body is incredibly smooth and silky, with a lingering finish. If you haven’t had this beer, give it a try! The clone (left): Pouring into an English-style pub glass, this porter is dark brown with an off-white head. Aroma is chocolate with notable dark fruits and herbal, earthy hop presence. Tasting the beer is more of the same, with strong dark chocolate tones, dark fruit. Also, the bitterness is pronounced, enhancing the dark chocolate flavors. The body is medium-full. Was it cloned: As they say close, but no cigar. Mine came out a bit fruitier with more bitterness and underlining earthiness. Where Fuller’s was sweeter, cleaner, more malt-forward, the clone was on the bitter side. I’ve never had London Porter in England, so the export version might not have been the freshest, but even so, there could be improvements. Taking BYO suggestion, I would likely bulk up the brown malt percentage to 15 percent, and drop the wheat addition. Also, I would drop the late Fuggle addition. Additionally, I would try a fermentation temperature in the low to mid 60s instead of 68 F, to reduce the fruitiness of Wyeast 1968. That being said, if you like the brown porter style with a firmer bitterness, this is a great recipe. Have any suggestions for brown porter brewing techniques? Leave some comments below! Cheers! Nice job. Definitely one of my most favorite beers in the world! Thanks! I’ll have to re-brew this one again. Cheers!